Hi everyone! It’s Karena and Katrina here from Tone It Up. 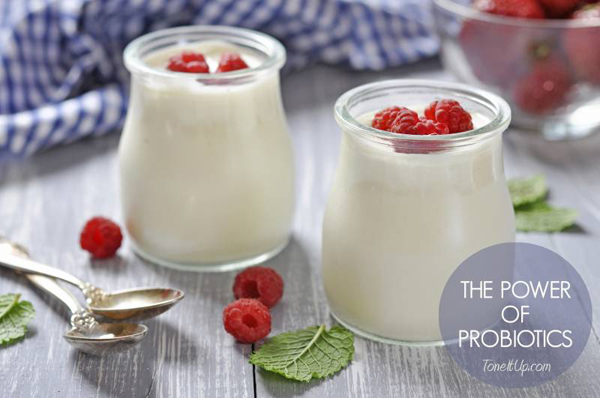 We’re sure you’ve all heard about probiotics by now. These are living microorganisms that occur naturally in some of our favorite foods (think yogurt, kombucha, pickled veggies and even chocolate!). While it may seem a little weird to consume living foods, eating probiotic rich foods replenishes the healthy bacteria in the digestive system, which is very important. Yogurt: Both soy and regular yogurts contain naturally occurring friendly bacteria. Kombucha & Kefir: These are beneficial and tasty drinks that contain probiotics. Both are made using a fermentation process and are great additions to your day! 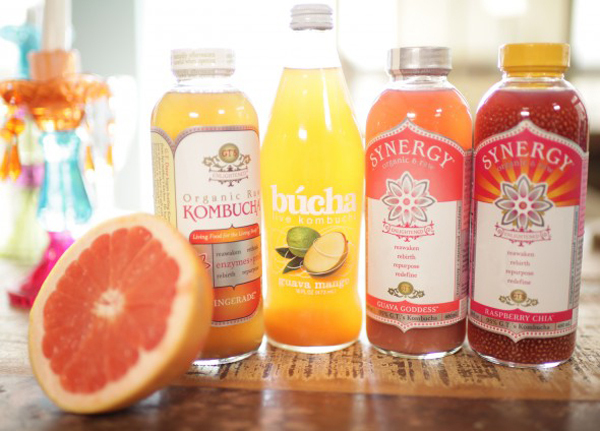 Kombucha is made by fermenting tea, making it a light, bubbly and refreshing drink. Kefir is traditionally made with milk, and tastes like a yogurt smoothie. We’ve also seen coconut Kefir if you are looking for a vegan alternative. Add a splash to smoothies for a tangy, healthy kick. Sauerkraut & Kimchi: These two foods provide other tasty ways to get your daily dose of probiotics. Made by fermenting veggies like cabbage, these good-for you condiments also contain vitamin B, which will give you energy and support a healthy immune function. Dark Chocolate: Yep, you read that right! You can actually find a variety of dark chocolate bars with probiotics added in. We found some at our local Whole Foods. Miso: Miso is a popular Japanese seasoning made by fermenting rye, barley or rice. It makes delicious soups, dressings and sauces. We talk a lot about miso in the Love Your Body Edition of our Tone It Up Nutrition Plan where you’ll also find our favorite Miso Soup recipe. If you are making miso soup at home, add the miso paste right before you take it off the heat to keep the living cultures intact. Pickles: Any vegetables can be pickled using a lacto fermentation process. Most regular pickles aren’t made this way, but if you look around, you should be able to find some. Or, you can make your own! Take a look at your Frisky Fall Edition for some homemade recipes. Tempeh: We love tempeh and it’s a great source of plant-powered lean protein. If you’re going meatless, this is a great option for adding protein to almost any meal. It is made by fermenting soybeans using a friendly fungus. The resulting cakes are good for digestion and promote the absorption of minerals. Eat up! I hope all of you enjoyed learning about the power of probiotics today. And stay tuned for more health and fitness tips in our post next month! What topic would you like to see us cover next time?